The flag of Syria was officially adopted on May 29, 1980. 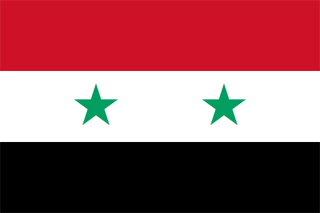 Syria's flag, inspired by the French Tricolor, uses the Pan-Arab colors of green, red, white and black. The two stars - (depending on the point-of-view) - either represent Syria and Egypt, or Syria and Iraq. 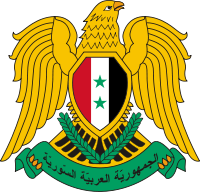 Syria's coat of arms consists of the Hawk of Qureish bearing a shield that displays the national flag. In the hawk's talons is a green scroll reading, "Syrian Arab Republic."